She studied Violin at L’Aquila Conservatory (Italy) with S. Budeer. After that she earned her Viola diploma with distinction at Froninone Conservatory. She attended many masterclasses of Violin, Viola and Chamber Music with K. Bogino, N. Beilina, and A. Mitterer (Mosaique Quartet). She’s particularly interested in Early Music performance, and collaborated with important ensembles, such as Le Concert des Nations (J. Savall), Concerto Italiano (R. Alessandrini), Ensemble Zefiro (A. Bernardini), Accademia Ottoboni, playing in the most important venues around the world. She recorded for the labels Outhere, Naive Opus 111, Hyperion, Stradivarius and for Radio 3. 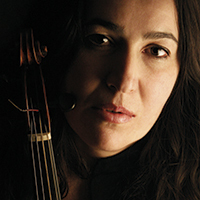 She currently teaches Violin at the Buonarroti School in Rome.